I have been making this recipe for years, but somehow have forgotten to blog it in the past. This is one of the easiest, tasiest dishes you can make. 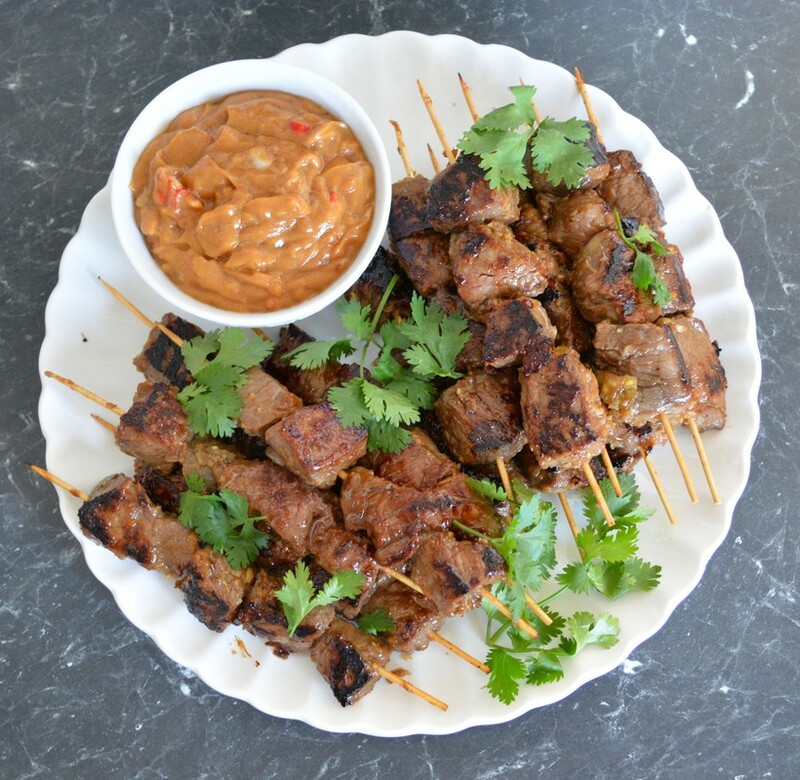 A simple marinade, a simple peanut sauce, a simple side dish, everything is simple, but the flavours, the flavours are amazing. This is great as you can prepare a lot of this recipe in advance, so perfect party food if you ask me, perfect mid week meal to. You can serve this with your favourite Asian greens, broccoli, bok choy, chinese broccoli, snow peas, whatever you love. ​I love to use this recipe Bok Choy with Garlic, Honey and Soy and then just interchange the greens to whatever I feel like eating on the day. You can just as easily make this using chicken thigh fillets, everything is the same except the cooking times. You would just want to cook it longer, for about 5-8 minutes, or until the chicken is cooked through. You could also make this with lamb, I know it works as that is what I order when going to my favourite Indonesian restaurant. The recipe makes for a lot of peanut sauce, so if you are doubling the meat quantity you don't need to double the peanut sauce recipe. The peanut sauce will keep for 4 weeks in an airtight container in the fridge. So looking to try something new, something you have loved while eating out, but don't know how to make at home, give this recipe a try, you'll love it.
. Combine the garlic, onion, kecap manis, oil, sugar and salt in a large snap lock bag, add the beef and rub well to coat. Refrigerate 3 hours or overnight if time permits. For the peanut sauce, heat the oil in a saucepan over medium heat. Add the onion, chilli, garlic and coriander and cook for 2-3 minutes until the onion is soft. Add the peanut butter and coconut milk, then cook for 3-4 minutes until warm. Stir in the kecap manis, palm sugar and 1 tablespoon lime juice. Taste and adjust seasoning adding salt and sugar as desired. Preheat a barbecue plate or grill to medium high. Thread the marinated beef onto skewers. Barbecue for 4 minutes (2 minutes on each side) or until cooked to your liking. Serve skewers with peanut sauce, steamed rice and Asian greens if desired.